"Have them make a chest of acacia wood - two and a half cubits long, a cubit and a half wide, and a cubit and a half high." The Ark of the Testimony  was the chest retained within the Tabernacle, a portable temple that was the centre of religious life for the ancient Israelites. Made according to the Lord's instructions given to Moses, it was the only man-made object the Jews considered holy. The ark was captured by the Philistines then later recaptured and taken to the Temple in Jerusalem on the instructions of King Josiah of Judah. However, it was never mentioned again in scripture and its fate remains a mystery to this day. Whatever the fate of the physical ark of the testimony, the NIV Bible contains its numerical equivalent, buried within the first few verses of Genesis and which I discovered in the most exciting way imaginable, by digging underneath the surface of scripture at the place marked by an 'X' on a treasure map. In Judaism, worship of graven images or holy relics has always been strictly forbidden - with one exception, the ark of the Testimony which, alone amongst man-made objects, was considered to be holy. The ark was made of acacia wood overlaid with pure gold (gold of course symbolises high value and excellence). The lid of the ark was called the atonement cover and was made entirely of pure gold. Two gold cherubim, known as the Cherubim of the Glory, were placed at either end of the atonement cover and faced inward towards each other, with outstretched wings. God's throne was between the cherubim on the atonement cover. The Ark of the Testimony was located within the Most Holy Place of the Tabernacle and was the focus of the rite of atonement, performed on the Day of Atonement (Yom Kippur). On that day, the Atonement Cover (called the Mercy Seat in the KJV) was sprinkled with blood to atone for the sins of the Israelites over the past year. This rite had to be performed annually to wipe out the sins of the Israelites for the previous year. The Atonement Cover has special significance to Christians, who regard Jesus Christ as their Atonement Cover, atoning for the sins of all mankind by his death on the cross. In Equidistant English I show how the first three verses of the NIV Bible contain Equidistant Letter Sequence (ELS) encodings, which suppliment the alphanumerical encodings that form the bulk of the New Bible Code. The ELS codes all consist of two or more words crossing or joining another to make a meaningful statement, and one of them reveals the location of the Ark of the Testimony. It is reproduced below. This is the 'X' on the treasure map and all I had to do to find the ark was to take my metaphorical spade and dig right there. "Then put in the ark of the Testimony, which I will give you." The first table shows how the first 37 words of Genesis (NIV) encode the 'Ark of the Testimony'. This is through their ordinal value, which is 1754, this number being the standard value of 'Ark of the Testimony'. This two-system decoding procedure is the hallmark of the New Bible Code. "Make an atonement cover of pure gold - two and a half cubits long and a cubit and a half wide." The lid of the ark was called the Atonement Cover in the NIV Bible, and the value of 'Atonement Cover' is encoded over the first 24 words! There is an analogy here with the outline of 24 discs surrounding hexagram 37, a figure that is found throughout these pages and which symbolises Jesus Christ, the Star of David. In chapter six of Secrets of Time, a free ebook by Rev. Stephen Jones of God's Kingdom Ministries, 37 represents God's Word and 24 represents the Priesthood. According to Bullinger, 24 represents heavenly authority and worship. These perfectly harmonise with the Genesis encodings and the meaning of the Star of David. The numbers 37 and 24 multiply to give 888, the value of Ihsous, Jesus in Greek. The two cherubim sat upon the atonement cover and as you can see are called the 'cherubim of the glory' here. According to Hebrews the altar of incense was within the Most Holy Place, along with the ark. Incense was also used in the atonement rite, therefore the encoding of the name here makes sense. So here we have the entire contents of the Most Holy Place, imprinted upon the first words of Scripture! Each word string proceeds from the very beginning of the text, like the Word itself proceeding from the mouth of God. These particular formal names are only found in the NIV Bible, out of the 48 versions I checked. All are given without the definite article too, another sign of deliberate action rather than chance. Given that the ELS encoding specifically locates the Ark within the first few verses of the NIV Bible, what are the odds against finding three word strings, each proceeding from the first word, with ordinal values equal to the standard values taken from the precise NIV wordings for the ark, its cover and the cherubim? There is a roughly 1-in-45 chance of any number being found in a word string. The average word value here is about 45 and so as we sum word values from the beginning we find that any partiular number will either be skipped over or, about 1 time in 45, landed upon. The odds against the three standard values being found here are 1 in 45 x 45 x 45, which is 1 in 90,000. What are chances of the altar also being included here? The odds against all four numbers being found are 1 in 45 x 45 x 45 x 45, which is 1 in 4 million. Also, note the emergence of a little numerical pattern here: the first three encodings cover 14, 24 and 34 words. Addendum (30/3/17): I've recently completed a page which I think gives a more accurate estimate of probabilities. Although the numbers above are accurate as an estimation of simple probabilities, they fail to take into account the fact that there are many important biblical items that could have been found there and might be considered significant. The NIV Bible has about twenty names for the ark alone, so there is about a 50% probability of finding one of them. So if we make the ark encoding a given, a better question to ask is "What is the probability of finding two structural components of the ark and the altar? ", the odds against it are about 1 in 90000. For Christians, Jesus was our 'atonement cover', his sacrifice on the Cross atoning for our sins and replacing once and for all the annual Day of Atonement sacrifices. This is why the curtain of the temple tore in two, to symbolise that God's glory was no longer confined to the ark within the Most Holy Place, but was now available to all. The role of Jesus Christ as the 'atonement cover' for our sins is brilliantly conveyed here by a matrix of encoded numbers within the first twenty-four words of the NIV Bible. A unifying feature of the following encodings is the number six, which in Hebrew is the numerical value of the letter Vav. This represents man, who was created on the sixth day. In cursive script, the letter Vav looks like the tent hooks used to fix the tabernacle curtains in place and you will see that here the number six has a similar function, 'hooking' them together into an integrated whole. There are six numerical signatures found within the encoding of 'atonement cover', which I call the Signature of Christ. The signatures cover exactly the same 24 words (the outline of the hexagram shown above) and are revealed by evenly dividing those 24 words into four shorter strings of 6 words. Note that they are in three pairs: Jesus/Yehoshua, Word/Word and Messiah/Messiah. Combined with the atonement cover encoding, the signatures brilliantly illustrate the concept of Jesus as our atonement cover, offer undeniable proof of the reality of the New Bible Code and are a central part of the message the code is delivering. 1. 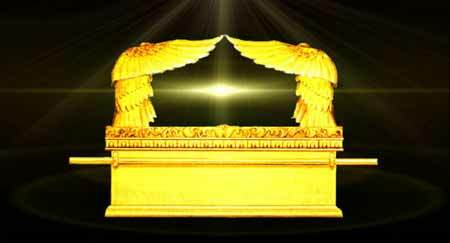 It is also known as the ark of the covenant and several other formal titles. In the 2011 version of the NIV Bible it is called the ark of the covenant law. The New Bible Code is held within the 1984 version. 2. According to Exodus 30 the altar of incense sat in the Holy Place in front of the curtain, which on the face of it contradicts Hebrews 9. However, on the Day of Atonement incense from the altar was sprinkled on the atonement cover, so it has been argued that the placing of the altar within the Most Holy Place may be meant in a theological sense, rather than a spatial one. In any case the ark of the testimony and the altar of incense are strongly linked within the context of the Day of Atonement. On that day the curtain was opened and the censer filled with coals and taken into the Most Holy Place: this could be considered to be an extension of the altar. In a religious sense the altar "stood before the Lord" (Lev. 16). Both the ark and the altar were sprinkled with blood by the high priest (Ex. 30). The altar was said to "belong to the oracle" (I Kings 6.22). So you can see that in terms of its religious significance, the altar belonged with the ark and that this is more important than its precise physical location. 3. The number 37 can represent two other basic 2D figures, a hexagon and an octagon (which is remarkable in itself, as it is the only small number known to have this property). But only hexagram 37 has a basic structural property (in this case the outline) represented by 24. 4. In English gematria, 37 is the reduced value of 'The Lord' and 24 is the reduced value of 'Holy' and 'Word'. In Hebrew, 37 is the ordinal value of Yeshu, a short form of the name Yehoshua (Jesus). In Greek, 24 is the reduced value of Ihsous. 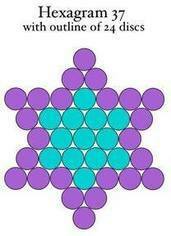 Another smaller hexagram of thirteen counters is highlighted inside the figure, and 13 is the value of Ahavah, the Hebrew word meaning 'love'.